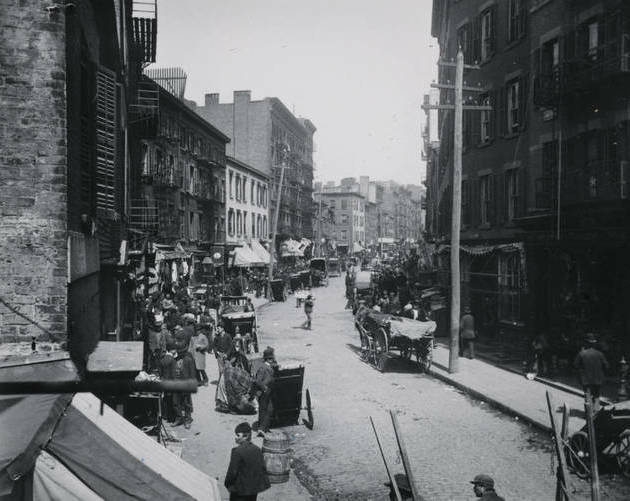 From the Bowery Boys to the Dead Rabbits, meet the Five Points gangs that were the real-life gangs of New York in the 1800s. “The Short Tail Gang,” a violent group of thugs and one of the most feared of the Five Points gangs. Circa 1880-1890. Bottle Alley, the headquarters of the Irish-American Whyos Gang. Circa 1880-1890. One of four men sharing a single cellar beneath a tenement home. Circa 1880-1890. America’s first true melting pot was a run-down Manhattan neighborhood called the Five Points. It was a cheap slum that lured in the poorest and least fortunate: sweatshop workers, immigrants, and newly-freed slaves, all trying to scrape by side-by-side through some of the worst living conditions in the United States. It was far from peaceful. Five Points was a place where life was short and violent, where race riots would regularly break out, and where diseases spread like wildfire. It was a place of thieves, brothels, and intense poverty – and the place where the original gangs of New York were formed. Gang colors cropped up across Manhattan for the first time in the early 19th century. The Bowery Boys, a gang mainly made up of firefighters, would go out in red shirts and stovepipe hats; the Shirt Tails went out with their shirt untucked; the Plug Uglies wore oversized beaver hats; and the Dead Rabbits would head out with a rabbit nailed to a stick. The Bowery Boys, perhaps the most infamous of New York’s 19th-century Nativist gangs (along with the Plug Uglies), were led most notably by founder Bill “The Butcher” Poole. A renowned pugilist and the inspiration for the character that shares his nickname in Gangs of New York, Poole died in 1855 after being shot in the back by associates of his rival John Morrissey. Morrissey led the Dead Rabbits, an Irish gang that frequently clashed with the Nativists who sought to keep immigrants like them out. Morrissey, a bare-knuckle boxer and all-around brawler, eventually rose above his street-level beginnings and became a U.S. Congressman, largely thanks to his connections with New York’s Tammany Hall political machine. All of the gangs of Five Points had their own way of letting people know who they stood with. Fights would break out over most anything. The Bowery Boys used violence to keep other firefighters from taking their contracts while Irish gangs like the Dead Rabbits would riot over discrimination. The Five Points gangs made their neighborhood one of the deadliest places on earth. It was said that they had the highest murder rate of any slum in the world. According to the legends, the most dangerous building – a housing tenement called the “Old Brewery” – saw a murder every single night. Above all, it was nationality and race that turned the Five Points gangs against one another. The Bowery Boys aligned themselves with the American Nativist Party, a staunchly anti-Catholic political group that believed that America belonged solely to the white men who’d colonized it. But with the Irish Potato Famine in full force, Irish refugees were rushing onto America’s shores, drawn in by the promised written on the Statue of Liberty. Nativists, like the Bowery Boys, saw that as a threat to their identity. Riots and fights broke out between the Bowery Boys and the Irish Dead Rabbits. In one brutal two day battle, an estimated 1,000 people took to the streets of New York to fight, beating each other senseless and looting one another’s homes. By the time the blood had dried, eight men were dead and up to a hundred more lay injured, an event that inspired Martin Scorsese’s Gangs Of New York. Race riots broke out again when the Civil War began. When draft cards starting going out to conscript New Yorkers into fighting for the Union, Irish gangs took their frustration out on their black-skinned neighbors. They set the city ablaze, smashed up fire engines, killed more than a hundred people, and even burned an orphanage for black children to the ground. For nearly a hundred years, the Five Points gangs practically ran the city. Little changed until photography Jacob Riis went in with a camera and captured their lives. Riis cataloged the lives of the people in Five Points in his famous book How the Other Half Lives, showing the world for the first time what it was like to live in the most abject poverty the nation had to offer. His book changed the face of the city and its approach to endemic poverty. Five Points was subsequently torn down piece by piece. Politicians railed for it to be ripped apart withone telling his constituents, “This hot-bed of infamy, this modern Sodom, is situated in the very heart of your City!” The notorious Old Brewery was pulled down, missionary houses were brought in, and bit by bit, the face of the city changed. The Five Points gangs were broken up and slowly faded into history. Though the groups died, the spark of what New York had become wouldn’t die out. Their world – a place where poverty and racial differences boiled over into violence and organized crime – would become a part of America; a way the other half lives. 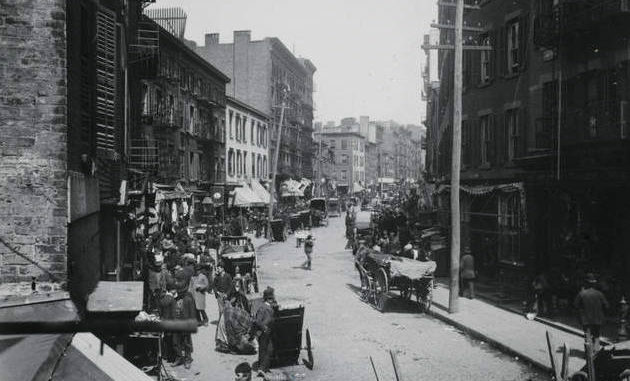 After this look at the Bowery Boys and the rest of the Five Points gangs that ruled 19th-century New York, read up on the nearby Bloody Angle, perhaps the deadliest street in American history. Then, see the legendary Weegee’s photos of New York’s Prohibition-era gang wars.